I got a lot of response to my last post about weight loss/gain/maintenance, so I wanted to follow up with a few more notes. My intention of that post was really just to talk about the math of the energy in/energy out equation and how [in my opinion] it makes more sense to just weigh yourself every day using a simple scale to determine how balanced this equation is for you. Basically, instead of getting RMR tests and trying to count every Calorie that you burn and every Calorie you consume [both tasks are fraught with difficulty and have a large margin of error], just take your weight at a consistent time and look at the rolling average to see if you are gaining, losing or maintaining, which in turn may lead you to make small adjustments to intake or expenditure. The part of the post that I got the most questions on though was the part about finding your ideal race weight. Here, it appears that I may have touched on a nerve [or perhaps "obsession"] that many endurance athletes have about reaching the lowest possible weight possible. This is where I get a little nervous about sending the wrong message and as a coach of junior athletes I am particularly sensitive about this. I also remember that as a high school wrestler, my own obsession with "making weight" by any means necessary led me to lose a lot of matches I should have won. Not to mention, those unhealthy behaviors most likely stunted my growth. It's impossible to know the actual numbers but claims have been made that about 30% of female cyclists and 10% of male cyclists suffer from eating disorders and I would suspect that the majority of us have (less chronic) disordered eating behaviors from time to time. So I just want to make sure that I am not overestimating the importance of weight loss here. But I am a numbers guy, so let's look at things in more quantifiable terms. The primary performance advantage of weight loss is that a rider requires less power to go the same speed, or conversely, they can go faster with the same amount of power. But how much power are we talking about here? Well, it depends. In a flat race where aerodynamics represent the overwhelming majority of the resistance, weight makes very little difference (though smaller riders do tend to be more aerodynamic). In an extremely hilly race, weight can make more of a difference. This year's Tour de France will include 28 Cat 1, Cat. 2 and HC climbs, so it's no wonder than the GC contenders obsess about their weight. In my opinion, one of the problems is that too many amateurs and even pros look at Contador, Schleck and Wiggins as the models for "the perfect cyclists body" even though the events that they themselves compete in have little resemblance to le Tour. I thought about the hardest, hilliest race that I had athletes competing in last year and immediately the Green Mountain Stage Race in Vermont came to mind. GMSR is one of the most difficult races on the East Coast and one that many non-climbers simply avoid. 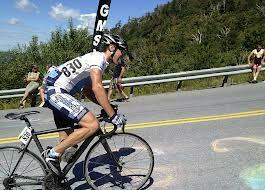 In 2012, the overall winner in the Pro/1 Men's race was Tim Johnson. He won the race because he was 2nd in the TT, 2nd in the Road Race and stayed safely in the pack in the Circuit Race and Criterium. The Time Trial course is 5.6 miles long and averages 1.2% grade. It starts with a 2.2 mile uphill and then is flat to rolling for the remaining 3.4 miles. Tim averaged 441 watts and finished in second place with a time of 13:39, 1.6 seconds slower than the winner, Remi Pelletier-Roy. The road race at GMSR is extremely challenging and is typically decided by the last climb, Appalachian Gap, averaging 8% grade for the final 2.7 miles of the race. Johnson averaged 401 watts for the climb and finished in second place with a time of 13:30, 21 seconds behind the stage winner, Logan Owen. Hypothetical Scenario #1: Johnson loses 5 pounds. Assuming that his power does not change (and this is a big if) he should finish the TT about 9 seconds faster (enough to take first place and have the leader's jersey after Day 1) and reach the top of the climb about 17 seconds sooner, which would have brought him close to Owen but not quite close enough to win that stage. At the end of the race, the overall results probably would have been exactly the same. - If he had been working hard to lose that 5 lbs, would it have affected his training leading up to GMSR? More importantly, would the training have adversely affected his preparation for the cyclocross season, which is his primary goal? (note: last week Tim Johnson was 19th place, the top American finisher at Cyclocross World Championships in Louisville, KY). - Would that extra 5-10 weeks of losing weight and constantly having an energy debt have meant that he had less energy for his workouts, possibly causing him to miss some training or not be able to produce the same power in his intervals needed to get him to a place where he was capable of producing over 441 watts in a time trial and over 400 watts in the last 13.5 minutes of a hard road race? - Would he have caught a cold because his immunities were compromised, which surely would have led to at least a few missed workouts? - Would he have lost some muscle mass if he had lost that weight? If so, even if it didn't affect his climbing ability, would it have affected his ability to stay with the lead group earlier in the road race or his performance in the other stages? Hypothetical Scenario #2: Johnson loses 5 lbs, which is 3.3% of his body weight, but also loses 3.3% of his power, thereby only producing 426 watts in the TT and 387 watts up App Gap. Given these numbers he would be about 2 seconds slower in the TT and 6 seconds slower on App Gap. He would still finish in exactly the same position in both stages, though certainly closer to 3rd place on both of the critical stages. Essentially though, it's basically a wash. So is it worth it? Well, knowing now how the race turned out, certainly not. But even when you don't have the knowledge of how the race will turn out, it's important to weight risk vs. reward. It should be noted that as a world class professional cyclist, Tim Johnson doesn't have a whole lot of fat to lose so it won't take very long before he starts to experience some adverse affects of the weight loss. An athlete that is carrying around 20-50 pounds of extra fat could be an entirely different matter though and the benefits of weight loss could go beyond simple power/weight ratios. First, all of that extra weight will cause you to operate less efficiently. Your body must work harder to keep itself cool during exercise. The physical presence of that much fat can interfere with bike fit as well, so the legs may have a tendency to track outward while pedaling, which is less aerodynamic and puts stress on the knees. In many cases, overweight riders will be forced to lower saddle height and adopt more upright (i.e. less aerodynamic) positions in order to ride comfortably. For most "regular people" and even the vast majority of elite and professional athletes, the goals of a diet plan should be 1) Feel good, 2) Be healthy and 3) Have enough energy for your training. Unless you have medical problems caused by being overweight or obese, weight loss should be a distant 4th place, if that. But even if you do have a significant amount of weight to lose, if you are able to train consistently you will probably lose weight anyway unless you make extremely irresponsible nutritional choices on a regular basis. Not to mention, most athletes will find that the more they exercise, the more their bodies crave healthy food. That said, I still recommend that athletes track their weight (and body fat if possible) daily. Having this information can help you identify if you are not getting adequate fuel for your training or if you are dehydrated. If losing weight is still a goal for you, weighing yourself every day can help you make sure that you are doing it slowly enough that it won't interfere with your training. Finally, if you get below your "ideal race weight" you will see the signs before things get too bad. Colin Sandberg is the owner and head coach of Backbone Performance, LLC. He is a Cat. 1 road racer, a USA Cycling Level II coach and a UCI Director Sportif. He is also head coach at Young Medalists High Performance and race director for Young Medalists/Team Rothrock. If you are interested in coaching or if you want to find out more, check out Backbone Performance at www.BackbonePerformance.com or like us on Facebook at http://www.facebook.com/BackbonePerformance. Thanks for reading!